Ihering, H.v. 1893. Die Süsswasser-Bivalven Japans. Abhandlungen der Senckenbergischen Naturforschenden Gesellschaft 18: 145-166. Kobelt, 1879, Abh. Senckenb. Naturf. Ges. : 437, pl. 22, fig. 4 [as ‘A. cellensis’]. Ihering, 1893, Abh. Senckenb. Naturf. Ges. : 153, fig. 4. Type(s): TYPE SMF_3683, Hakone-See Japan. Ihering, 1893, Abh. Senckenb. Naturf. Ges. : 152, fig. 1. Type(s): TYPE SMF_3681, ? Hakone-See ? Japan. Ihering, 1893, Abh. Senckenb. Naturf. Ges. : 161, fig. 3. Type(s): TYPE SMF_3641, Hacone-See, Japan. ‘Lea’ Kobelt, 1879, Abh. Senckenb. Naturf. Ges. : 423, pl. 12, figs. 1-2 [as ‘Unio japanensis’]. Ihering, 1893, Abh. Senckenb. Naturf. Ges. : 158. Type(s): TYPE SMF_3648, Umgeb. v. Yokohama. Anodonta calipygos Kobelt. — Ihering (1893: 150). Anodonta gibbum Bens. — Ihering (1893: 162). Anodonta haconensis sp. n. — Ihering (1893: 153). 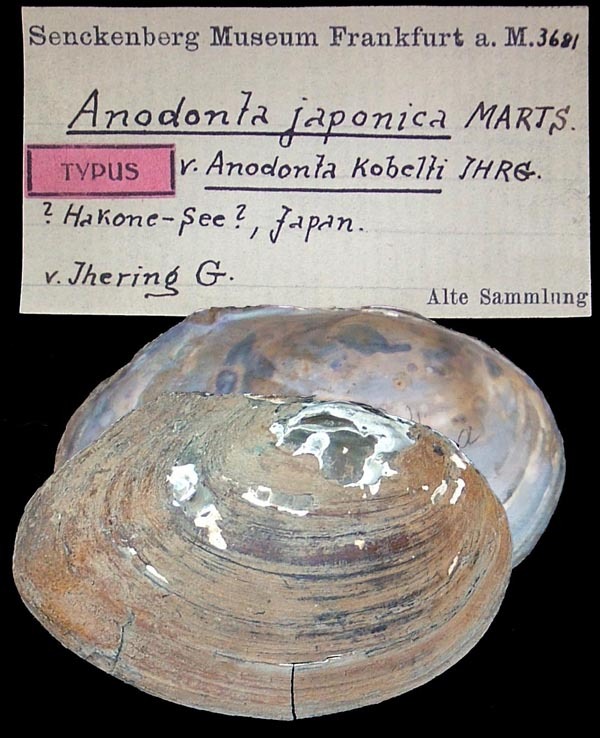 Anodonta japonica (Mart.) Clessin. — Ihering (1893: 150). Anodonta kobelti sp. n. — Ihering (1893: 152). 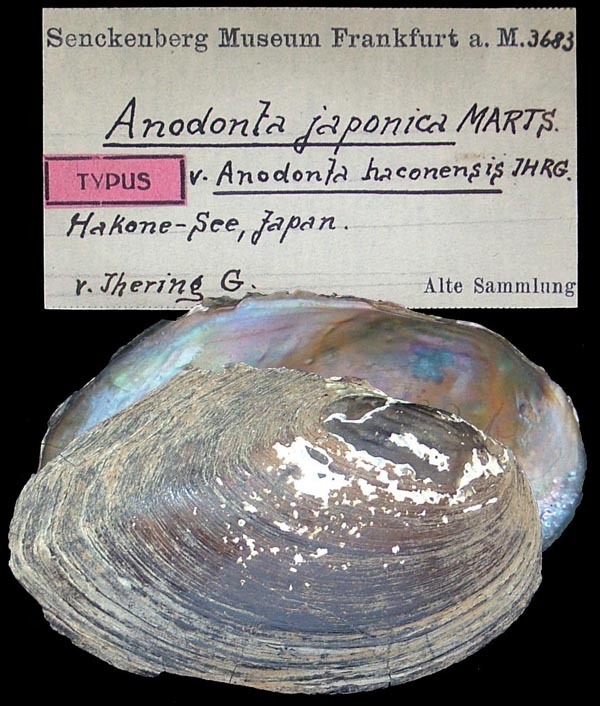 Anodonta lauta v. Mart., 1877. — Ihering (1893: 150). Anodonta magnifica Lea. — Ihering (1893: 162). Anodonta pulchella “Heimb.”. — Ihering (1893: 162). Anodonta reiniana (v. Martens). — Ihering (1893: 147). Anodonta woodiana Lea, 1837. — Ihering (1893: 151). Cristaria discoidea Lea. — Ihering (1893: 162). Cristaria herculea (Middend.). — Ihering (1893: 146). Cristaria plicata (Humphr.) Sol. — Ihering (1893: 147). Cristaria spatiosa (Clessin, 1876. — Ihering (1893: 145). Margaritana margaritifera (L.). — Ihering (1893: 155). Unio biwae Kobelt. — Ihering (1893: 159). Unio brandtii Kobelt. — Ihering (1893: 157). Unio grayanus Lea. — Ihering (1893: 162). 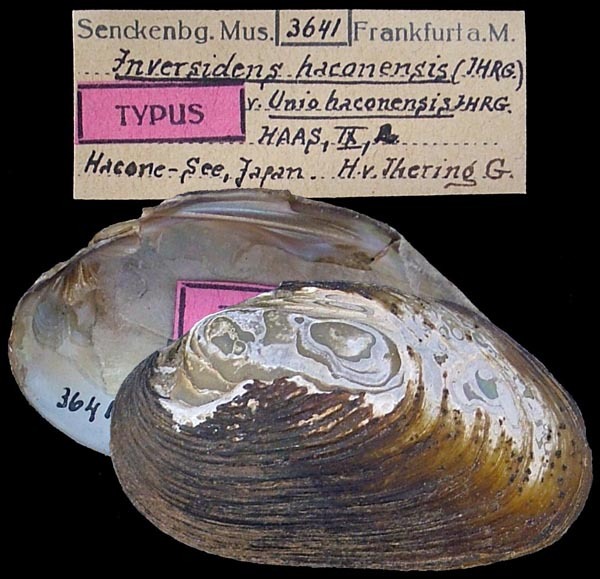 Unio haconensis sp. n. — Ihering (1893: 161). 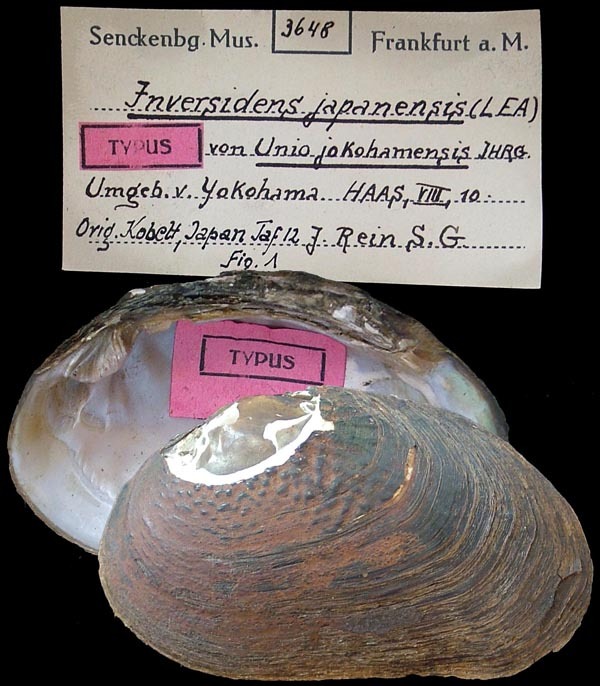 Unio japanensis Lea. — Ihering (1893: 157). Unio jokohamensis sp. n. — Ihering (1893: 158). Unio leai var. Gray. — Ihering (1893: 162). Unio murchisonianus Lea. — Ihering (1893: 159). Unio nipponensis v. Mart., 1877. — Ihering (1893: 160). Unio oxyrhynchus v. Mart., 1861. — Ihering (1893: 156). Unio reinianus Kobelt. — Ihering (1893: 157). Unio schlegelii v. Martens, 1861. — Ihering (1893: 156).